Аннотация к книге "Paris: History, Architecture, Art, Lifestyle, in Detail"
This sumptuously illustrated reference book is for serious Paris-lovers who seek information beyond what can be found in a traveler`s guidebook. 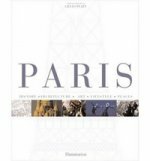 Paris is the first title from a major new series of classic, elegant guides to the monuments and mysteries of Europe`s great capitals, illustrated by 600 photographs documenting sweeping panoramas, hidden corners, and stylish interiors. The handsome volume details all aspects of the city from an engaging and accessible insider perspective. Each chapter covers diverse themes such as the city`s history, its architectural riches, and its great art treasures. Discover how the Louvre chateau developed into the artistic encyclopedia it is today, and what life was like when Paris was just an island in the marshes of the Seine Valley. Unmask the layers of Parisian architecture by identifying how the modern capital today resembles the city as it existed during the Revolution of 1789. Bear witness to how centuries of war and turmoil have shaped this great city. Enticing accounts of memorable walks around the city combine with inspirations for making the most of the capital`s rich culture. An anthology of texts by authors who have captured the city in prose will extend the armchair traveler`s Parisian adventure. With comprehensive detail and personal insights from the team of specialist writers, this glorious volume is the ultimate indulgence in the insatiable love affair that is Paris. Paris: Art, Architecture, History, Lifestyle, Places opens the doors to the true soul of Paris, drawing readers into the intimate secrets and reveries of this most magical of cities.